The NutriChef Pressure Cooker / Rice Cooker, Multi-Function Food Prep – Features: Cook Smarter: Prepares Food Up to 70% Quicker – Enclosed Pressure Cooking Preserves Natural Food Flavors – Retains Beneficial Vitamin & Mineral Nutritional Value – Sauté and Sear Food with Delicious Results – Ability to Cook, Bake, Steam, Boil, Braise, etc. – Integrated Pressure Safety Valve and Lock-Top Lid – Energy & Time Efficient Food Prep – Re-Heat / Keep Warm Function – Simple & Hassle-Free Operation – Extra Wide Non-Sticker Inner Cooking Pot Container – Digital Display Panel with Time Control – Built-in Preset Cooking Modes – Kitchen Timer Alarm Notification – Easy-to-Clean Stainless Steel Housing – Non-Stick Teflon Coated Removable Cooking Inner Pot – Used for Rice, Soups, Meat, Poultry, Vegetables & More – What’s in the Box: Pressure Cooker, Measure Cup, Rice Spoon, Soup Spoon, Power Cord, Technical Specs: High-Powered Heating Element: 900 Watt – Cook Pot Capacity: 5+ Quarts – Maximum Time Setting: Up to 24 Hours – Power Cable Length: 3.9′ ft. – Dimensions (L x W x H): 11.2” x 11.2” x 11.8” – Weight: 7.49 lbs. – NutriChef Model Number: PKPRC66. Ability to Cook, Bake, Steam, Boil, Braise, etc. Power Cable Length: 3.9’ ft.
POWER PRESSURE COOKING: is the process of cooking food, using water or other cooking liquid, in a sealed vessel, known as a pressure cooker. As pressure cooking cooks food faster than conventional cooking methods, it saves energy. Pressure is created by boiling a liquid, such as water or broth, inside the closed pressure cooker. The trapped steam increases the internal pressure and allows the temperature to rise. 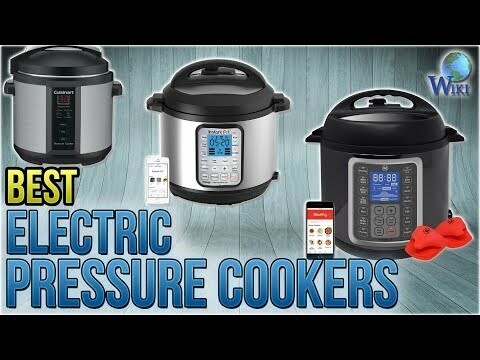 WHAT’S PRETTY GREAT ABOUT THE PRESSURE RICE COOKER The pressure cooker is highly efficient – it uses far less energy than many other appliances, since it cooks so quickly and leverages the pressure powers of steam. HEALTHY LOW FAT COOKING: Bacterial or other contamination is largely not an issue with Pressure cooking. you have adjustable cook time setting and a keep warm function so you do not need to remove it when its ready to eat. 7-In-1 Multipurpose Pressure Cooker for all Your Cooking Needs: Pressure Cooker, Classic Slow Cooker, Rice/Hot Cereal Cooker, Sauté/Browning, Yogurt Maker, Steamer, Warmer & Canner.